The debut of the comic book character Superman occurred in June of 1938 with the publication of Action Comics No. 1. Superman's first film appearance came a few years later - he debuted in an animated series of seventeen Superman cartoons, beginning with Fleischer Studios' creations from 1941-1942, in an agreement with DC Comics. Dave and Max Fleischer were responsible for the first nine Superman cartoons (the pilot and eight subsequent shorts). The first Superman short, Superman (1941) (aka The Mad Scientist), which premiered in late September of 1941, introduced the terms "faster than a speeding bullet" and "Look, up in the sky!" The most famous of the series was the second entry, The Mechanical Monsters (1941) with the super-hero battling giant flying robots - and marking a redesigned Lois Lane and the first time Superman would change into his costume in a phonebooth (and his sole use of X-ray vision in the series). The Fleischer's last film was Terror on the Midway (1942), with the remaining eight shorts produced by Paramount's Famous Studios during 1942-43, beginning with Japoteurs (1942). 1941 24 year-old Orson Welles, called America's "boy wonder" or wunderkind, directed and acted in Citizen Kane (1941), a movie about a powerful newspaper publisher named Charles Foster Kane (modeled after William Randolph Hearst). "Boy genius" Welles was the first to ever receive simultaneous nominations in four categories: as producer, actor, director, and writer. 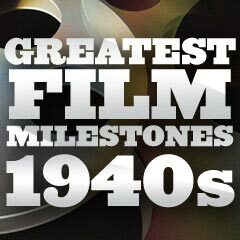 It has been the most highly-regarded film in cinematic history, with many ground-breaking film techniques. The controversial film, banned from advertising in all of Hearst's newspapers, was noted for its creative experiments with sound (i.e., overlapping dialogue and layered sound), for its numerous complex flashbacks (and non-linear fragmented storytelling with overlapping narrative from multiple perspectives), and for Gregg Toland's cinematography, including innovative camera angles (low-angle shots revealing ceilings), montage, mise-en-scene, deep-focus compositions, tracking shots, whip pans, lengthy takes, and dramatic, contrasting or expressionistic low-key noirish lighting. 1941 RKO's Citizen Kane (1941), director Orson Welles' first feature film, opened for its world premiere at The Palace Theatre in New York City amidst great controversy over its 'negative' portrayal of publisher/tycoon William Randolph Hearst - the alleged source for the main character of Kane. Originally, it was to open at Radio City Musical Hall. 1941 Reclusive Swedish actress Greta Garbo retired early at age 36, after the release of her disastrous comedy, the box-office flop Two-Faced Woman (1941). She announced that she was quitting the film business, left Hollywood, and remained out of the spotlight until her death of natural causes in 1990. 1941 For the first time in Academy history, two real-life sisters were nominated in the Best Actress category: Joan Fontaine for Suspicion (1941), who defeated sibling Olivia de Havilland in Hold Back the Dawn (1941). Fontaine was the only performer to win an Oscar in a film directed by Hitchcock. 1941 A Senate subcommittee launched an investigation of whether Hollywood was producing films to involve the United States in World War II. It was dissolved shortly after the attack on Pearl Harbor in late 1941. 1941 Approximately 500 animators and artists at the Walt Disney Studios conducted a five-week strike backed by the Screen Cartoonists' Guild, during the making of the animated film Dumbo (1941). The Disney workers demanded pay raises and the right to unionize, which they won when the strike was settled by federal mediation. The strike seriously changed the atmosphere of the studio and affected the work produced there for years to come. A number of notable animators left Disney to work for other studios. In the meantime, Dumbo's song "Baby Mine" was nominated, and the film won the Oscar award for Best Scoring of a Musical Picture. It also featured the surrealistic sequence of "Pink Elephants on Parade" representing Dumbo's psychedelic visions after he swallowed some champagne. 1941 Bette Davis became the first female president of the Motion Picture Academy of Arts and Sciences. 1941 Universal Studio's cycle of horror films was revived with Lon Chaney Jr.'s appearance in the title role (aka Larry Talbot) in The Wolf Man (1941). Chaney was following in the footsteps of his famous acting father, Lon Chaney, Sr. It was Universal's second werewolf film, following Werewolf of London (1935), the first Hollywood mainstream werewolf movie. Chaney continued to appear in four more Universal wolfman sequels: Frankenstein Meets the Wolf Man (1943), House of Frankenstein (1944), House of Dracula (1945), and Abbott and Costello Meet Frankenstein (1948). The Wolf Man was the only Universal horror character to be played by the same actor (Chaney) in the 1940s sequels. 1941 The first, generally-acknowledged film noir was released, John Huston's directorial debut film The Maltese Falcon (1941). It was the first detective film to use the shadowy, nihilistic noir style in a definitive way. The mystery classic was the privotal work of novice director John Huston, and also starred former screen heavy Humphrey Bogart. The cycle of classic film noirs with a recognizable visual style, would last until 1958. 1941 The Society of Independent Motion Picture Producers was founded by Mary Pickford, Charlie Chaplin, Walt Disney, Orson Welles, Samuel Goldwyn, David O. Selznick, Alexander Korda, and Walter Wanger. The Society aimed to preserve the rights of independent producers in an industry overwhelmingly controlled by studios. Citizen Kane (1941) and Fantasia (1940) were among the acclaimed films produced by Society members. 1941 The first Hollywood musical to acknowledge that World War II (1941-1945) was occurring was MGM's and Busby Berkeley's Babes on Broadway (1941), a Mickey Rooney and Judy Garland teaming (their second 'backyard musical'), in the film's special salute to Britain (then fighting valiantly against the Nazis) in the number Chin Up! Cherrio! Carry On! 1941 The longest uninterrupted screen kiss, clocking in at 3 minutes and 5 seconds, was found in the film You're in the Army Now (1941), between Jane Wyman and Regis Toomey - a recod that held until it was replicated or broken by Big Top Pee-Wee (1988). The world record for the longest on-screen kiss was then surpassed by the 6 minute kiss in the film Kids in America (2005). 1941 Republic Pictures' 12-chapter film serial The Adventures of Captain Marvel (1941) opened, adapted for the film screen from Fawcett Comic's Captain Marvel comic-book character. The title role was played by Tom Tyler, with alter-ego Billy Batson (Frank Coghlan, Jr.). Some sources claim the serial was the first superhero film adaptation taken directly from a comic book.